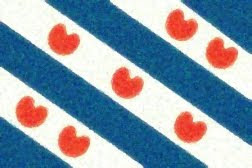 Fun With Frisian: KEAL - "calf" / "When Pigs Fly"
Keal is pronounced with an "ih" as in "bit" followed by a schwa. KIH-uhl. This word shows up in the Frisian equivalent of "when pigs fly"... instead of pigs flying, we have calves dancing on ice! Remember from the previous lesson, as is pronounced a lot like the English "Oz" and means "if," "as," or "when." De means "the" and is said with the schwa sound. Keallen (KIH-uhl-uhn) is the plural of calf. You can see it used here on Youtube as the title of the music recording we were looking at in previous lessons. Keallepoaten means "calves' legs." Poat is the singular form of "leg" and is said with a full "oh" as in "boat" and a schwa. POH-uht-tuhn. It is said with a schwa and means “the” or “it.” UHt. Iis means "ice" and is said with a long "ee" as in "creek" (a frozen one) and a very soft -z on the end. EEz. Dûnsje is said with a full "oo" as in "moon" and a -y- followed by a schwa on the end. DOONSyuh.